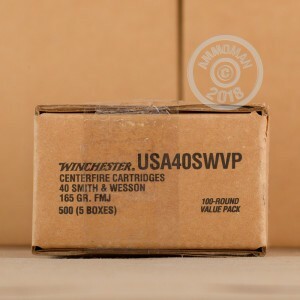 You will get a lot for your money with this 40 Smith & Wesson Ammunition manufactured by Winchester Ammunition Company! 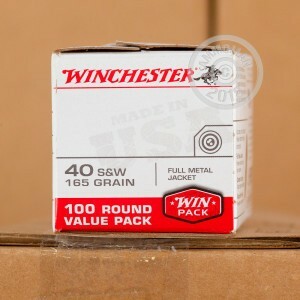 This 40 S&W Winchester USA FMJ ammo is recommended for target practice and range shooting. The 165 Grain Full Metal Jacket bullet is great for a day at the range. These rounds are packaged in a case of 500. They are manufactured with new, reloadable brass casing and non-corrosive boxer primers. Winchester, founded in 1866, has earned a stellar reputation for offering quality products to citizens and the United States military. With its rich history in the Wild West, Winchester is often referred to as "The American Legend." Winchester continues to maintain a high standard of quality, making it a leader in the ammunition industry. Ordered 500 Winchester 45 ACP on 1/30/2017, at my door on 2/1/2017. Great $ and fast shipping. First order, will not be the last. Thanks Ammoman! 500 rounds in three days without any failures! Went through about 300 rounds at the range in 1 day and never had a problem!